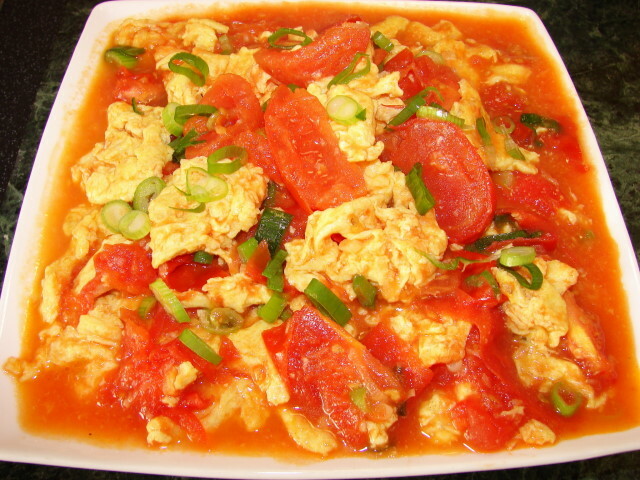 The above names all mean the same stir fried tomato with egg or scrambled egg with tomato, the Chinese way. These tomatoes I used were so red, the juice looks deliciously red too. There is no regional boundary where this dish comes from in China, it is popular among all Chinese not just in China but also worldwide unless anyone hates either or both the main ingredients. Such a simple dish but there is more than one way to cook it. I have tried it all and here is my review. Method 1 : Cook the egg and tomatoes separately then mix them together. This is my preferred method too. Most people like to cook the egg first then the tomatoes, but I like to do the reverse. 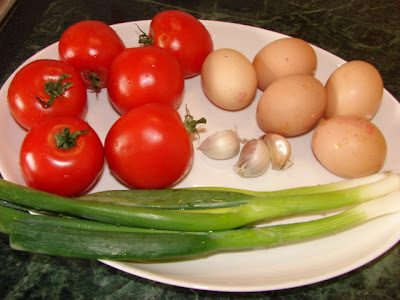 I find cooking the eggs first if it is still soft, the egg will set to a large lump when adding to the cooked tomatoes. Method 2: Some prefer to cook the tomatoes then stir in the beaten egg at the last minute just to set it. I find this method can be a hit and miss sometime the egg can become too soft like a thick sauce than separated pieces of scrambled egg. Also with this method the egg is likely to stick to the pan/wok if it is not super non stick, and scraping it off will end up with tiny bits of overcooked egg. . This is the way how I cook this dish. Is there a technique with the tomatoes? Yes. The cooked tomatoes must be rather soft and juicy. First to think about is selecting the right tomatoes. Best use bright red, ripe and juicy tomatoes anemic looking ones make this dish unappealing. Some people prefer to skin the tomatoes but I never bothered. To skin the tomatoes just blanch in boiling water till the skin is peelable. Next is the cooking time, the tomatoes must be cooked long enough to soften and juice running out. I like a lot sauce with this dish so I normally add some water. If the tomatoes are still quite raw and hard this will take much longer too cook or there won't be enough sauce for the egg to absorb. To balance the sharpness of tomatoes do not be afraid to add sugar, amount to your taste or sweetness of the tomatoes. If the tomatoes are quite anemic and tasteless, the trick is to add some tomato paste not too much just enough to colour and beefing up the tomato flavour. If the tomatoes are still quite firm when you bought them, leave them out at room temperature to ripen. Room temperature tomatoes taste better than cold. How to scramble the egg there is a technique too. Some people prefer to stir fry or scramble the egg till the egg surface has turned brown this gives a nuttier flavour but the egg will be tougher. For me I like the egg soft and fluffy but still in chunks. To do this first is to beat the egg till lightly frothy just before cooking. I normally like to add some slacken cornflour to make the egg nice and soft, also a touch of cooking wine and salt to flavour the egg. The secret to fluffy egg is super hot wok and quite a bit of oil so when the beaten egg hits smoking hot oil it will fluff up right away and set really quickly without making it tough. If using too little oil or medium hot oil the egg will cook but will not be fluffy. Fluffy egg will absorb the tomato juice better. Flavouring for this dish is really simple, just some chopped garlic, spring onion and a little cooking wine. The only seasoning is just salt and some sugar to balance the tomato. If you find just salt is lacking flavour you can add a touch of light soy or fish sauce. I like mine simple. Tomatoes and eggs ratio is also important. To much tomato may turn this dish really sharp and lacking the eggy flavour or too much egg will lack the right balance too. I normally use 1 egg :to about 125g tomato. This is the best simple home cooking when tomatoes are much nicer and tastier in the summer when they in abundance and much cheaper. If you like the sound of this dish. Give it a try. Simple and tasty with rice or nice with noodles too. Ingredients needed : tomatoes, eggs, chopped garlic, chopped spring onion, cooking oil, some Chinese cooking wine, cornflour (cornstarch), salt and water. Tomato paste is optional if tomatoes are not too flavourful or red. This is the quality of ingredients I am using. Cut tomatoes into wedges no thicker 2.5cm. Mix a dash of cooking wine with some cornflour or cornstarch (about 1 tbsp wine and 1 tsp cornflour to 2 eggs) and pinch of salt. Add egg and beat till frothy with pair of chopsticks or fork. Chop some garlic and few stalks of spring onion. Add some oil fry the garlic and some of the chopped spring onion till fragrant. Add in tomato pieces, stir fry for a minute or two till tomato pieces are heated through and beginning to soften. Then add in a splash of water. Cook tomato till soften and juice is running out. Have a taste if too sharp add some sugar. If tomato is quite tasteless add a small dollop of tomato paste. Keep the sauce runny, if not enough add a little more water. Season with enough salt (and/or soy or fish sauce) to taste. Remove and clean the pan or wok. Heat the wok till very hot, add in about 5 - 6 tbsp of cooking oil and swirl the oil around the wok/pan and heat till smoking hot. Pour in the egg you will notice the egg fluff up very quickly. Stir with a pair of chopsticks till egg has scrambled into pieces and soft set. If you like a nuttier flavour do not touch the set egg for few seconds and let some pieces browned on the bottom. The amount of oil can be quite a lot but this makes a difference to the texture of the egg. Stir in the cooked tomato and rest of the chopped spring onion. If you find the sauce too runny for you liking you may thicken it with a little slackened cornflour. If sauce it too dry add a touch more water. I used to eat this all the time when I was an English teacher in Taiwan. The aiee would make it for the kids and I would always join in when she served this. I'm so glad you posted this recipe! Very easy to make and very much a comfort food. Thanks. I miss this! We have this dish in the Philippines as well, though it's just one of our torta (scrambled eggs) variants. My mom used to make it when I was younger.